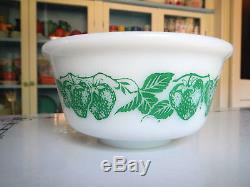 Item: Very rare vintage kitchen mixing bowl. 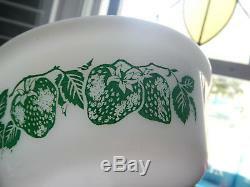 Pattern: Strawberries, mixing bowls, collectible milk glass bowls, kitchen bowls. Size: 6 7/8" wide and a tad under 4" tall. 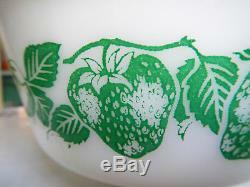 Color: White Platonite milkglass with an original fired-on green strawberry print. 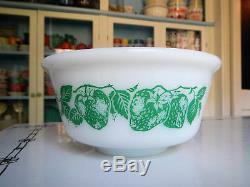 Inside looks to be a white enameled. 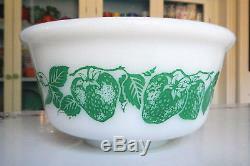 Condition: It is hard to tell in my photo but this bowl is very bright and shiny to the glass and the green strawberry pattern. There is very little to no wear to the pattern. 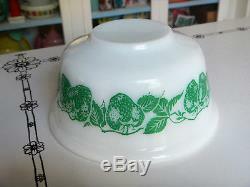 No chips, cracks or roughage but this bowl has been used and does have some inside use scratching, please see photo #6. 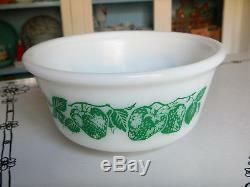 Quantity: One, I do not know if this bowl was made in only this size or came from a set? North in SC Treasure Hunt items are not just listed on here. 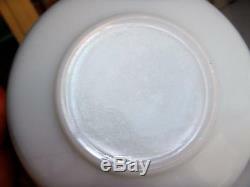 We sell to reserved buyers, on other web sites and at our local market. We reserve the right to cancel any listing that has no interest. When it's gone, it's gone! 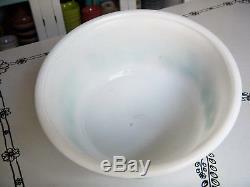 The item "Hazel Atlas Platonite Milk Glass Green Strawberry Mixing Bowl Very RARE" is in sale since Monday, September 3, 2018. 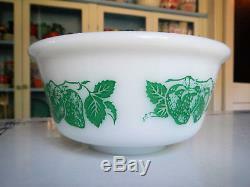 This item is in the category "Pottery & Glass\Glass\Glassware\40s, 50s, 60s\Hazel-Atlas"." and is located in North, South Carolina. This item can be shipped worldwide.